Total Merchant Services now offers free email marketing through Groovv offers with all new merchant accounts! Groovv gives you the tools you need to grow your business—including free email marketing, social media marketing services, and mobile text marketing—so you can create customer loyalty by building your fan base. 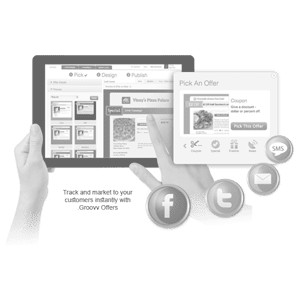 Normally a premium service, Groovv and Total Merchant Services have teamed up to provide you with social media marketing services and mobile text marketing for free, with email marketing thrown in as well! Truly, if you are looking for marketing online, along with industry leading merchant services, Groovv paired with Total Merchant Services is for you; read on for more information about our free marketing services. How does the Groovv Offers Free Marketing tool work? Groovv integrates mobile text marketing, Facebook, Twitter and free email marketing into an easy to use online tool. With services from Groovv, you are able to create custom trackable offers, effective (and free) email marketing campaigns, and a host of other incredible features that are sure to improve brand loyalty. You’ll also have the ability to get your message in front of with customers, get the word out about sales or special events, or simply enhance your online presence—all through Groovv’s simple and easy to use online interface. Overall, Groovv is an incredibly powerful tool and service that has been proven to increase profits up to 8% or more, improve site traffic, and overall positively augment your company. Now if you take advantage of the Groovv point of sale system Groovv offers is integrated so that it’s easy to keep connected to your customers. In today’s digital age, social media marketing services and email marketing are exceedingly important to the success of a company. Without the 1:1 consumer interaction—as well as the added visibility—your company gains from social media, it’s incredibly hard to succeed, and it’s even harder to hit it big. With Groovv and our free email marketing tools, you get all that and more, rendering it one of the most important services in your company’s arsenal. Best of all, If you were to subscribe to Groovv without the free services offered along with our credit card processing you would pay around $1,800 a year, including a $30 monthly fee with other expenses. We offer this at no cost—including free email marketing, free social media marketing, and mobile text marketing—along with our low cost credit card processing services. You can also combine any of our free credit card terminal offers with this service at no additional cost. In the end, Groovv Offers allows you to get more business in to the door and keep your customers coming back to your business earning you more revenue. It’s an easy service to use, and many merchants only will spend 5 minutes a week in creating a new offer—something that can often result in an 8% increase in top-line revenue for your business. To get information on how Groovv Offers can help your business grow, contact Chris today at 1-800-518-6825. He can’t wait to hear from you soon!